Solange was one of the many celebs that attended the Carol’s Daughter Launch Event held at Sephora in New York the other day in celebration of the launch of the new hair product Monoi. 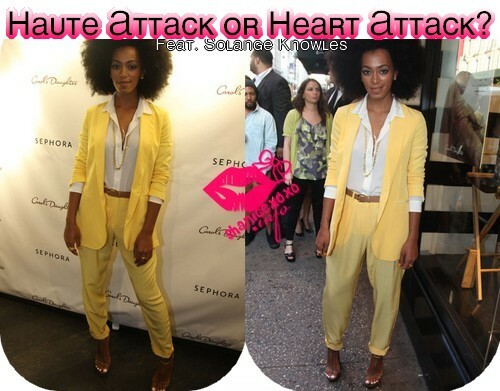 Solange wore a yellow pants suit (can you say SPRING?) paired when a contrasting brown belt. & To keep the attention on the suit she wore a simple grey heel. What do you think? Do you like it? Was it a miss for Solange? LOVE the natural hair! She looks AWESOME!